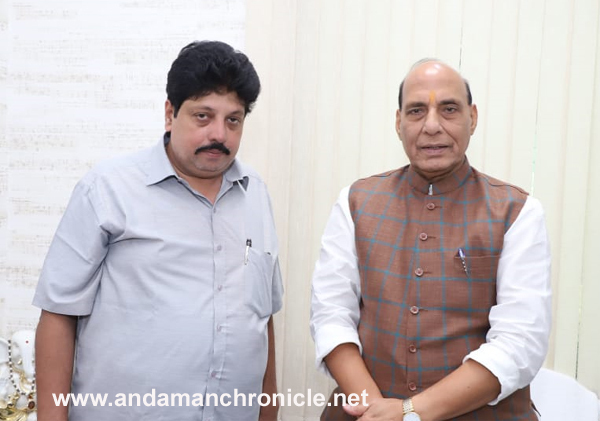 Port Blair, Sept. 10: The State President BJP, Vishal Jolly met the Hon’ble Union Home Minister, Shri. Rajnath Singh at New Delhi today. Jolly urged the Home Minister to implement Domicile certificate in A&N Islands, demand for 100 percent reservation to island youths in government jobs and to implement the National Register of Citizen (NRC) in A&N Islands to stop the population influx. He also discussed about the ongoing developmental works and required various develops for the future of this islands. The Union Home Minister assured to that necessary and appropriate action will be taken for the benefit of island youths and islanders.